How do you solve a problem like the Manic Street Preachers, if you’re the Manic Street Preachers? Choices abound; keep churning out the legacy tours in front of beery/teary nostalgists in concrete ice hockey arenas? Go hip-hop collaborations in search of a more youthful demographic? Quit? The Welsh trio’s problem has always been that they’ve cared too much, meaning that the career decisions which others of their generation have found straightforward vex them. Literate, angry with a small “A” and politically astute, no matter how carefully their words are written, their actions have betrayed them. Was for instance Journal For Plague Lovers really the attempted full stop it seemed to be? Of course not. Did their last album Futurology place more value on style over songs? not quite. In the subsequent four years band spokesman Nicky Wire has been painfully honest about the self-doubt which began as a whisper and turned into a roar in their collective thoughts patterns; what is relevance and how in nearly the third decade of the new century does it manifest itself? Resistance Is Futile is their response to those and many other questions, a record on which they’ve lost their ability to translate their inspirations into allegories, but musically have broken themselves back down to the fireworks and fist pumping brio of Generation Terrorists, a form they’ve only allowed themselves to be in only sporadically ever since its release. You can read the full review by clicking here. (A new window will open). 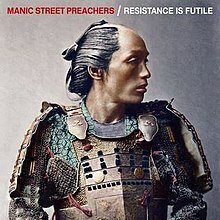 I do like the Manics. I just recently purchased “This is my truth now tell me yours” on vinyl and reminded myself exactly why I do. However, I find their work in recent years just there. Great when you’re listening to it but forgettable when it’s over. Hopefully, this new one breaks the trend.